John Smoltz began his career as a dominant starting pitcher and finished it as a remarkable closer. Along the way, he was a vital member of the best pitching staff of the 1990s with the Atlanta Braves and reached a level of statistical success that baseball had never seen before. 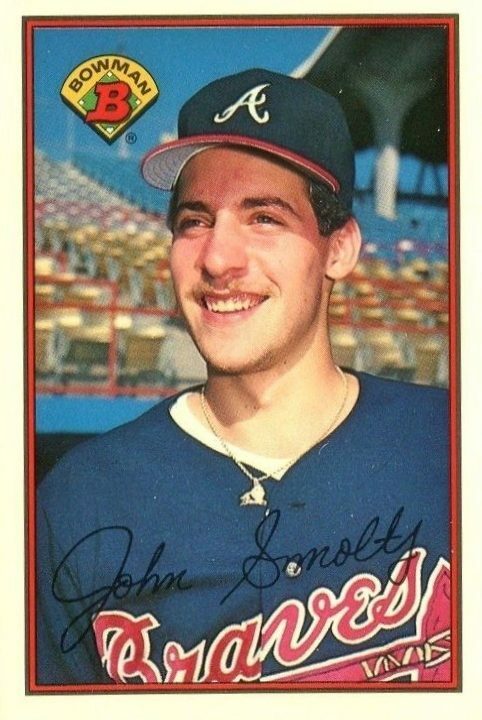 The following list of the key John Smoltz baseball cards includes several noteworthy rookie releases along with autograph and insert appearances. 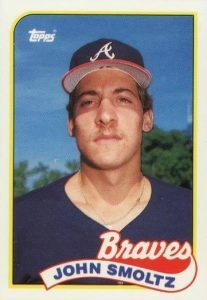 After beginning his career with the Detroit Tigers organization in 1985, Smoltz was traded to the Braves in 1987 and would shortly thereafter find great success. By 1996, he was the best pitcher in the National League and he won the Cy Young Award by going 24-8 and leading the league in innings pitched and strikeouts. His 1998 season was equally impressive, finishing 17-3 with an amazing .850 winning percentage. Shop for Professionally Graded John Smoltz cards on eBay. Smoltz would miss the entire 2000 season following Tommy John surgery and, upon returning to the mound, he was converted to a closing reliever. He excelled there as well by saving 55 games in 2002 and becoming the second pitcher to ever have a 20+ win and a 50+ save season. 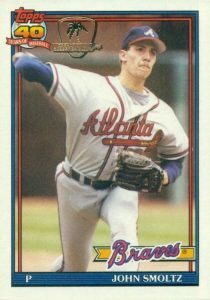 Along with Braves pitchers Greg Maddux and Tom Glavine, John Smoltz helped the Braves dominate baseball in the 1990s, winning five National League pennants and a World Series championship (1995). In addition to regular season success, he put forth a 15-4 career playoff record in 41 appearances. Smoltz retired in 2009 as the only pitcher in baseball history with more than 200 wins and 150 saves. His long run with the Braves allowed him to become just the fourth pitcher to record more than 3,000 strikeouts with the same team. It was no surprise that he became a first-ballot Hall of Famer in 2015. While two pre-rookie, minor league cards make an appearance on the top ten list, Smoltz has a third notable minor league card released in 1988 ProCards. This prospect card features him with the Richmond Braves, Atlanta's AAA team. 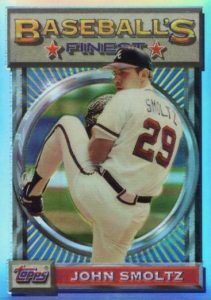 After Smoltz debuted with the Braves in 1988, nearly every set featured a rookie card of him, so there are far too many to cover in this guide. A few rookie appearances that couldn't be included here, but are still worth highlighting, are found in 1989 Upper Deck, 1989 Topps Big, and 1989 Donruss. Among the other interesting John Smoltz cards that didn't make the list, 2008 Topps Heritage features an ultra-rare photo variation of Smoltz in which it looks like he is a left-handed pitcher as he holds his glove up near his face, ready to throw. 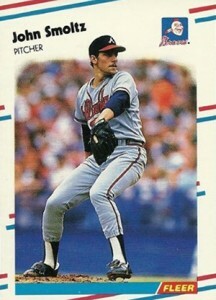 A plus for Braves collectors, Smoltz shares several relic cards with his Atlanta teammates Tom Glavine and Greg Maddux. 2014 Topps Heritage includes a triple relic card featuring all three players, while in 2014 Topps Gypsy Queen, lucky collectors could pull a Glavine and Smoltz dual autograph. Braves fans will also start salivating over a triple autograph in 2015 Topps Triple Threads that features Smoltz, Glavine, and Chipper Jones. John Smoltz pitched for 21 seasons and his baseball card canon includes many outstanding and popular cards. In determining the selections for this list, the card's value was used as the main determining factor along with card design and availability to collectors. The first of two minor league cards to make the list comes from the 1987 ProCards set. 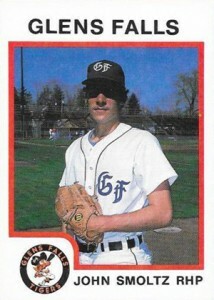 The early card features Smoltz during his brief time with the Glens Falls Tigers, which was the AA team for the Detroit Tigers. Glens Falls would be the last team Smoltz played for within the Tigers organization as he would be traded to the Braves in exchange for veteran pitcher Doyle Alexander near the end of the 1987 season. A more recent John Smoltz autograph that makes the cut comes from 2016 Panini Flawless and features a card honoring Smoltz's time with Team USA Baseball. He was the ace of the pitching staff on the Junior National Team during the 1985 World Championships and the team reached the finals but lost to Cuba. As Smoltz skipped college baseball and went professional after being drafted by the Tigers, he was not able to represent the United States on the Olympic team. 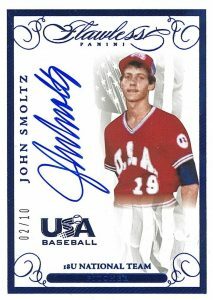 Collectors can find several color versions of Smoltz's USA Baseball autograph in the Panini Flawless set, including red, white, and blue (which is featured below). He also has several other signed cards in the Flawless set. As you will find a little further down the list, Smoltz had only one major league card produced as a part of the 1988 season while the remaining options that collectors traditionally consider his "rookie cards" were produced in 1989. Topps resurrected the Bowman brand in 1989 and also issued a Tiffany version of the slightly oversized set. It is estimated 6,000 complete sets were created and printed on a glossy white stock, making for one of the most limited sets during this era. For collectors familiar with 1991 Topps Desert Shield (a group of roughly 7,000 sets of 1991 Topps cards that were gold foil stamped and made available to military staff during Operation Desert Shield) you may notice that the foil stamping on Smoltz's card is not typical. The Desert Shield stamp is usually in the top-right corner or slightly lower in the same corner if the card has a "#1 draft pick" designation. To avoid stamping over the player's face, Topps would sometimes move the stamp location next to the 40th Anniversary logo instead. This demonstrates that Topps put more work into this limited edition release than just simply adding a foil logo to excess Topps sets. More so than other sets of its day, the condition of the Desert Shield cards are certainly a factor when determining value. Mint cards are obviously pretty rare for cards that traveled such a long distance partnered with a lack of penny sleeves and toploaders in the military setting. In 2015 Topps Finest, Topps issued dual autograph cards for Tom Glavine and John Smoltz as part of the Finest Affiliations insert that featured either great teammates or rivals from different teams. Glavine and Smoltz pitched together from 1988 through 2002 (and again briefly in 2008) and combined for an amazing 452 victories between them during those seasons. They also brought to Atlanta a combined three Cy Young Awards and a surprising five Silver Slugger Awards as both Smoltz and Glavine were some of the best hitters among pitchers in the National League. The two have also signed a handful of other cards together. The design and technology that went into 1993 Topps Finest debuted at the 1993 National Sports Collectors Convention and almost immediately became one of Topps most popular products. While the sleek printing process wowed fans, the scarcity of the Refractor cards got the attention of early hit seekers. There are estimated to be about 250 Refractor sets, which is enough to allow a steady stream of them to be available on the secondary market but still not become too plentiful for any one player. Similar to card #8 on this list, card #4 features a high-quality, glossy version of a standard Topps set. This time, it is Smoltz's Topps rookie card from 1989 Topps Tiffany which features the most high-end cards Topps produced at the time. While the print run here is much higher than the 1989 Bowman Glossy cards as 25,000 sets were created, the demand for Smoltz's first Topps card is also much stronger. 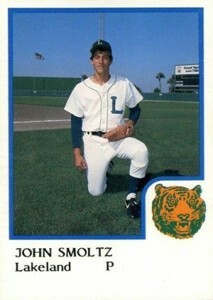 You can find the very first professional trading card for John Smoltz in the 1986 ProCards set that features the roster of the Detroit Tigers single-A team, the Lakeland Tigers. Smoltz, a native of Michigan, was an elite baseball and football player in high school and must have been elated to be selected by his local team in the 1985 amateur draft. However, he would be traded away two seasons later as the Tigers were in a playoff run and leveraged one of their top pitching prospects for more immediate pitching needs. It would, of course, become a trade the Tigers surely regretted making. Smoltz's first certified major league autograph is part of the 1996 Leaf Signature Extended Autographs set. 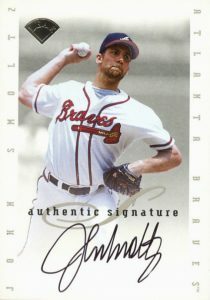 Players featured in the Extended series typically signed 5,000 copies for their card but Smoltz was featured as a short-printed autograph and only added his John Hancock to 1,000 copies. On top of that scarcity, Leaf also issued a limited Century Marks parallel that featured the first 100 cards signed by the short-printed players (including Smoltz). It can be distinguished by the holographic foil logo. Fleer beat everyone to the punch by including Smoltz in their 1988 Fleer Update series and this card is his first in an Atlanta Braves uniform. The Update set could be purchased as a 132-card factory release and, like many of the sets in those days, a high-quality Glossy version of Fleer Update was also available. Those sets came in a lithographed metal box and the Glossy versions hold about double the value of the standard cards. High-graded copies of Smoltz's MLB debut can fetch more than $100 at auction, which is impressive for cards of this era.